Meru, or Mahameru, is a divine mountain mentioned in the Puranas and epics and is witness to several incidents in Hindu tradition. When a cycle of creation ends, all living beings followed Dharma get shelter on the Meru. As per Puranas, heaven is located on the peaks of the meru, netherworld is at the base and earth is located in the middle portion. Hindu Puranas mention that the height and breadth of Meru is 84,000 yojanas. One yojana is equal to 8 miles. It is also believed that the Mountain holds the Earth – this is because 16000 yojana of the mountain is beneath the earth. 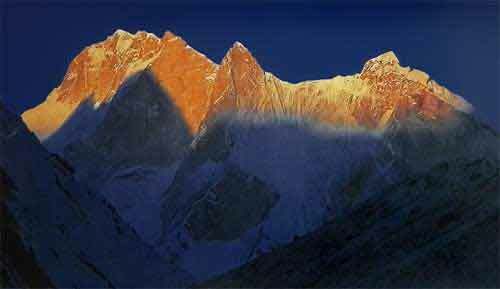 The peaks of meru are covered with gold and Kailash, on which Shiva is seated, is one of the peaks. All gods and goddesses reside on the Mahameru. Sun and moon goes round the mountain and the Saptarishi Nakshatras rise and set on it. The base of the mountain is filled with life saving herbs. The mountain is guarded by Nagas and therefore sinners cannot enter the mountain. Meru is filled with sweet songs of birds. There are twenty chains of mountains surrounding Meru, and Kailash is on the south. The golden-colored peak is believed allow Surya to rest on it during transit. There are eight cities around the mountain in eight directions presided over by different gods. It is also said that at the time of destruction of tripura (three fortified cities) of the three demons by Shiva, Meru formed the flagstaff of Shiva's chariot. The most popular legend associated with Meru is that the mountain shelters all the good things on earth during the great deluge. This story is part of the Matsya Avatar of Vishnu (you can read it in this article).